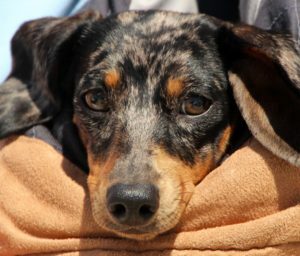 Our little Teckel Greta (2,5 years old/ 5kg ) ate some poisoned cat food in our Urbanization / Nueva Andalucia . After 5 min we knew there was something terribly wrong with her – she had cramps and was shaking ! While we drove to the Pointer Practice of Dr. Andre Evers , I phoned there to announce us, and when we arrived , everything was already prepared to help our little one as fast as possible ! Andre and also his Head Nurse Dalit stayed with Greta all the time , fighting for her life, checking the heart rate , Oxygen and so on until her condition was stable again maybe after 2 hours! Both saved her life and we will never forget what a great job they did !!!!! THANK YOU SO MUCH Andre & his great Team !!!!!!!! I came to Marbella from Moscow with my 7-year old daughter Masha in late December last year, bringing with us all our small Zoo – 5 months old puppy golden retriever Walter, old but still looking nice Chihuahua Ricky and Sphynx cat Lisik. Walter was growing up pretty quickly and we didn’t notice any problem until he couldn’t stand up after an evening walk. He kept whimpering trying to get up but he failed. I panicked, thinking that his back legs were paralyzed. I looked on the Internet for emergency services and found Pointer Veterinary Clinic Marbella. A pleasant men’s voice said in English that clinic was closed but in case of emergency they were ready to help me with my poor puppy. That was the case ! I explained the situation to Dr. André and he immediately invited me to clinic despite the fact that it was 10 p.m.! This human kind treatment and attitude made me happy and confident that we were not alone in this beautiful but new country. My daughter and me loaded pretty heavy Walter into the car and brought him to the clinic. Doctor Andre met us, made examination, took care of the dog, explained what had happened to him, gave the medicine, defined the treatment and helped put Walter back to car. Since that evening we have started our friendship with the team of Dr.Andre’s Pointer Veterinary Clinic Marbella. Doctor Andre and his team Jennifer and Dalit were always helping me, consulting me in details on all issues. Finally Walter also went through surgery on his hind leg joint, a hip resection , which was brilliantly performed by Doctor André and his team. In rehabilitation period Doctor examined Walter each day and we were feeling ourselves surrounded with warmth and care! Our family is so much obliged to André, Jennifer and Dalit! Unfortunately we had to come back to Moscow recently, but we gratefully remember Doctor André for his help with our dog Walter, now healthy and lucky! 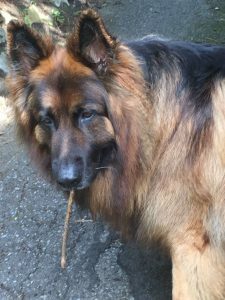 We came across Pointer Marbella by chance……….My favourite boy, Mason, a 5 year old German Shepherd, had been plagued with a problem since last June/July. I’ve spend hundreds of pounds with my UK vet trying to sort out the problem and on the last visit was told he maybe had a urinary infection and was given anti-biotics. The condition worsened during our holiday so we visited Pointer Marbella and specifically Dr. André……within minutes of an examination and an echo we had a proper and concise diagnosis and all our options were discussed. An interim remedy was undertaken and then ultimately surgery. Mason re-attended the clinic and was dealt with sympathetically, taking care to respect as was fondly termed his ‘prima donna’ needs. We stayed with him until he fell asleep and beyond the howling after surgery , as he was on his own , he was perfectly fine following the removal of a tumour that was missed on numerous occasions by our UK vet. Putting aside the reasonable cost…..the service and caring is second to none. This clinic appreciates your pet is part of the family…….. I have worked with abandoned animals for many years, and Pointer Clinic Marbella have offered invaluable support throughout this time. Every stray animal has been treated with the same compassion, care and affection as those who come to the clinic with their owners. The team is always on hand to give me help and advice – no matter how big the problem, and they have always gone out their way to do the very best for abandoned animals; from food donation and medicine to free treatment. Thank you so much for your help Pointer Clinic Marbella.